The Dave Hall Cellerciser® is built for performance, safety, and functionality—using the highest-quality materials on the market. Its compact frame and sturdy construction make it ideal for both indoor and outdoor exercise, with easy storage and setup for added convenience. It’s the best investment you’ll only need to make once! 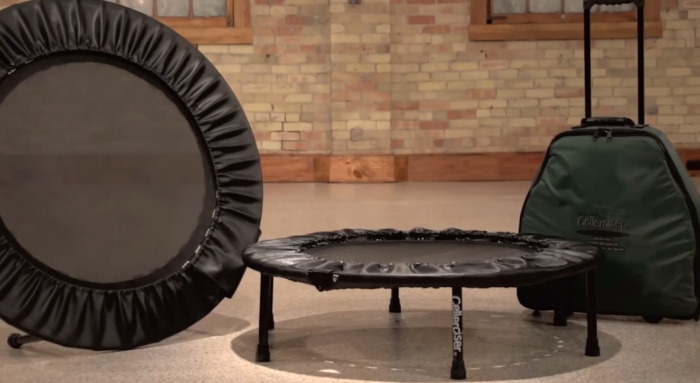 This mini-trampoline is the best exercise piece of equipment for your ageless lifestyle. Exercise only 10 MINUTES A DAY to change your life! The ONLY Rebounder I recommend using is the Dave Hall Cellerciser®. Make an appointment to try it at my office in Walnut Creek. Here in my home in California, I will show you how to get a natural facelift! Dave Hall how to use his Cellerciser® to tone the face muscles and shed cellulite quickly. The liquid crystal matrix of a woman or man is made up of 50-75 trillion cells. Your body is an astounding orchestra of living cells. The balanced and harmonious functioning of these trillions of cells is called health and the imbalance and dissonant functioning leads to illness of all sorts. Contemporary medicine is habituated and addicted to the treatment of the “symptoms of illness.” The fact that it ignores promoting the “causes of health” that is sadly revealed in the astounding statistic that medical students receive on average less than 5 hours of training in nutrition. Something is seriously wrong in our medical model. Unfortunately for you and me, the model of health and illness that dominates our culture is inside our thinking and ways of perceiving. When an illness arises - most people naturally seek a physician to “treat the symptoms.” Restoring and promoting the “causes of health,” such as better circulation, better nutrition, more hydration and exercise are an afterthought if addressed at all. I have seen this in my own life and recognize the pattern in my clients, friends and family. We live in a delusion of wrong thinking and we will continue to live and suffer there until we flip our thinking around and immediately start to assume that when an illness arises, the causes of health need to be strengthened. 25 years ago I was entering the great hall of a large health convention. Descending on the escalator I saw a figure bouncing up and down surrounded by a huge crowd of people who were pressed around him. I was so curious to see what he was doing and pressed my way to the front. Here is a man who looked like a body builder and was saying that years earlier he was in terrible shape; overweight with many mild and severe medical conditions. Jumping on the mini-trampoline was the only exercise he was doing and in less than a 2 years he transformed his health and fitness. Meeting Dave was a revelation to me about the power of our bodies to heal themselves. I purchase one of his trampolines. I have been exercising on this for 25 years now. I work out in my home. No smelly gym, no treadmills, confusing weights and I save time and money by not traveling to workout. I though I knew a lot about his inventions and products, and I do, but being in his company has opened my eyes to the enormous significance of his research and programs. It turns out that Dave spent the last 25 years speaking to all kinds of audiences worldwide about his radically effective exercise program and in presenting so generously his findings, many doctors, researchers and people experiencing the many benefits of his invention and teachings began sharing with him what they were finding. Known as “Mr. Rebounder” to many in the health industry, he was approached at these conference by a series of doctors and health experts eager to share with him what was happening to his clients. His office also flooded with detailed testimonials from people recovering from illnesses, achieving weight-loss, mobility, strength and flexibility. Year after year the letters came in and year after year the doctors sent him their findings and recently his list has grown to over 60 health conditions which have now been documented to have been mitigated or to have disappeared completely though exercising on his Cellerciser®. The picture that has emerged explaining why this is happening is so exciting to me. I have long known that we have two circulatory systems. In Europe, the two working together has been more widely accepted and taught. Medical treatments in Germany include lymphatic therapy. I have been trained by 1st generation of practitioners who served with the originator of this therapy, Dr. Emil Vodder. The lymphatic therapy has been part of my own practice throughout my career. In America, circulation is mostly thought of as our cardio-vascular system. However, it is the lymphatic circulation along with the cardio-vascular circulation that is greatly enhanced during safe jumping exercises. These movements help circulate the lymph fluids through the large and small lymphatic vessels and capillaries, as well as unclog the lymph nodes. The lymphatic system is responsible for removing the wastes and toxins, so it makes sense that when its circulation is enhanced our immunity is increased dramatically. This increase in the efficiency of the circulation is a major factor in increasing our health. Ironically, as he played a central role in the explosion of interest in jumping for health on mini-trampolines, an industry grew that capitalized on this trend and began turning out cheap imitations. Not only are they made of shoddy materials but they are capable of injuring people and now have a long history of tragic consequences. Dave himself experienced this in his own family. His father, inspired by a talk with him, purchased a cheap copy of the Cellerciser a few months later, without telling Dave, and shortly after using it injured his back, badly and was permanently disabled. Dave shared with me how devastated he was by this and began a national campaign to inform people of the dangers resulting from using improperly designed and tested rebounders. I noticed something in Dave that touched my heart deeply. His youthful enthusiasm is as vibrant today as it was 25 years ago. He is a real ageless living pioneer. Dave uses a lovely term, “our health potential.” He and I are committed to increasing and extending the health potential of people around the world. Through changes in our thinking, nutrition and exercise we can move mountains. In my comprehensive programs I supply my clients with his high-quality, trifold Cellerciser®. It is an essential tool to achieve a healthy foundation for my pioneers in ageless living. David has spoken to over 100,000 individuals, doctors, health practitioners, and universities. David has delivered over 2,000 lectures and speaking engagements in the past 15 years. as an inventor and speaker, David’s personal mission is to inspire physical, mental, spiritual and emotional health and well being in people of all ages. In 1990 David’s appearance was of the average American male. He stood 5’10.5” and weighed 170 pounds. He had rounded shoulders, a weak back, poor digestion and circulation, inefficient elimination, aching knees, a potbelly, and double chin. Then he was introduced to a rebounder. He bought one and jumped every morning for a month and his whole body responded to the exercise. He noted that his belt needed tightening. Within six months people remarked about his more erect posture and increased musculature. He left like an athlete. David’s change eventually impressed others who asked him to lecture a group of employees. He was invited to speak before Rotary Club meeting, Lions International, the Kiwanis International, and senior citizen centers. Three years later, David had become so popular he began to travel the United States the ten-minute Cellercise Program.